So, today is the first day of what I will refer to optimistically as "summer break" but what is, in actual fact, glorified unemployment. Thus, hopefully the beginning of the end for all the projects I have started during the school year but left unfinished, citing not enough time as the excuse. There's all the time in the world, now. (EDIT: Before I fixed it, I had used three quotations in this paragraph. Raych, please forgive me.) As you can see, the quilt that I had been making the blocks for (It has no name yet... usually I am a quick and lazy quilt namer, but I haven't come up with one for this yet. Suggestions?) 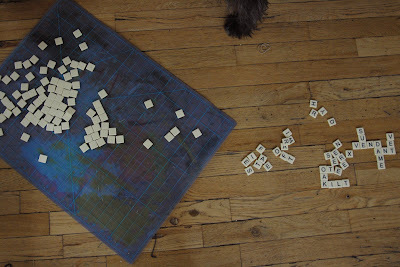 has been laid out, and now needs to be pieced, which, mneh, I am not looking forward to. See all those blocks? I know everybody else on the internet does awesome , ridiculously time intensive stuff with teeny weenie blocks and strips, but I am used to slapping 25 blocks together and being done with it. Gulp. 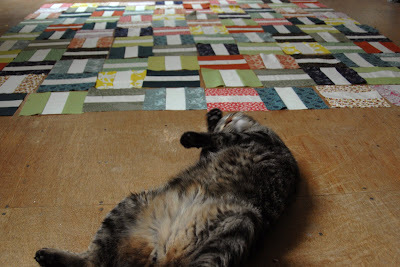 The quilt will also have a white border around it that is the thickness of the blocks. As you can see, the recently pieced Big Stair (See? Quick and lazy quilt name.) is still waiting on ye olde flannel board to be sammiched and quilted. The beloved Viking better get herself prepared for a workout. I aim to please. This is for Rachel. And my Mom. ...so much faster than I am interested in finishing them. 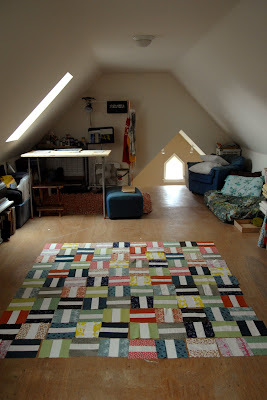 The newest big stair is pieced and ready for sammiching/quilting, but am I doing that? 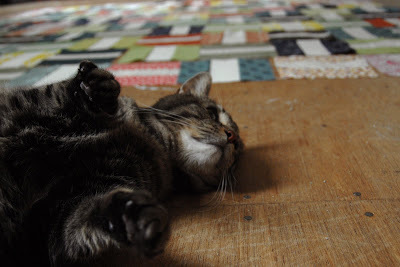 No, I am starting another quilt top. And, I have a new quilty obsession: Kona Premium Muslin (in natural). It makes my heart go pitter pat. 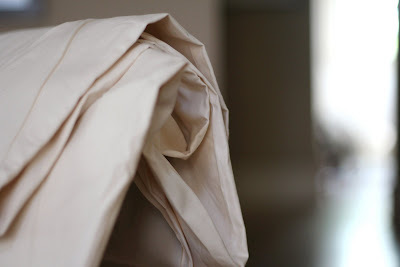 And I know that probably there are many good reasons why muslin is usually inside quilts, (or maybe there aren't? I don't know, I haven't googled it,) but I am using this stuff on the outside, because it is gorgeous and silky and thick and creamy and I want to take a bath in it. Sigh. It is dreamy. I bought 4 yards, and at FULL PRICE! ($8.99, JoAnn) Because it is so fabulous. Also, did I mention 108" wide? And I took pictures of it. Muslin. 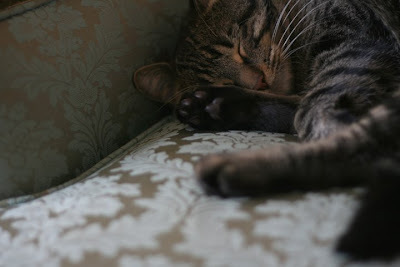 I took pictures of it, and I will probably make wallets and walk around showing everyone that I meet my beautiful muslin that is waiting for me at home, folded over the chair, where it is slowly getting covered it cat fur. Whatever. So worth it. Ok. 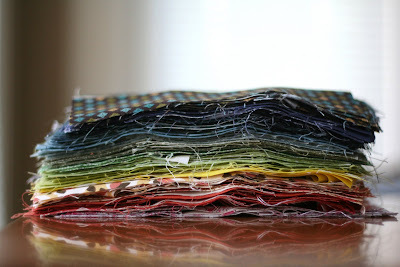 So, as you can see, the new quilt is a bit rainbow-tastic, but it should calm down when it is laid out because it won't be put together in color order. 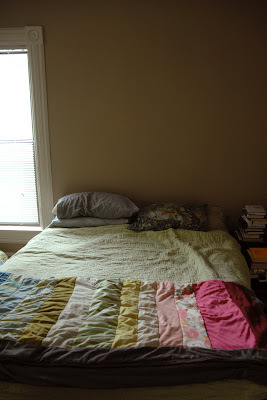 The husband is consulting on this one, as it is BIG, and will actually be a functional house quilt. It should be around 70x77 when finished, which is the biggest quilt I have ever made, and I am semi-terrified of the process. 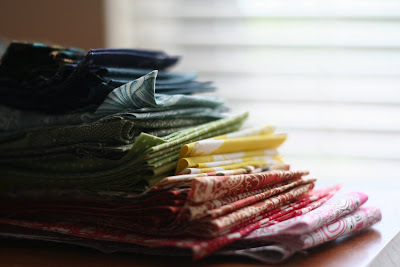 However, this is the LAST WEEK OF SCHOOL, so I should have lots more time for quilt finishings right around the corner. PS: Becky was so right. And Sarah. But Becky was right first, so, Becky, send me your address and I will send you a prize. I don't know what yet, but a prize is a prize. Also, thanks everyone else for playing.